Buying 6.4 steem worth of Tron (TRX) Over bittrex. TRON is so cheap at 1 penny I believe people will buy it, even if EOS and steem are better tech. 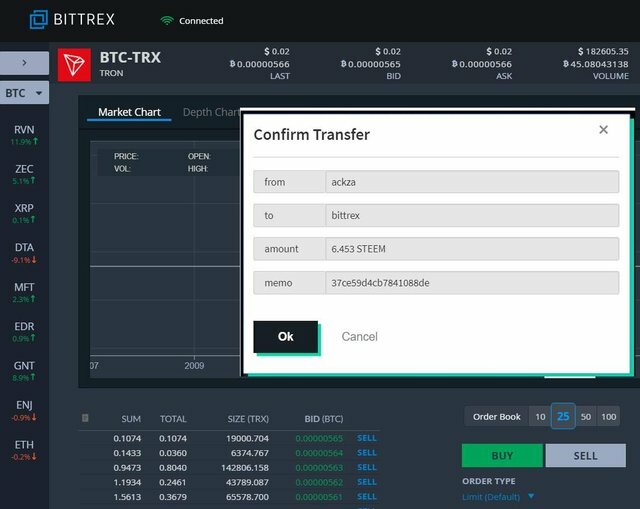 #share2steem I sent 6.4 steem over to #bittrex so I could buy over 100 #Tron #trx tokens because they are only 1 cent and even with 100 billion+ supply and Tron being DPOS and its name being the same as Disneys Tron, means that the marketing will be insane with people in #vrchat building special in game wallets and people using regular name accounts to send money in games. Same for #eos and #steem #cryptocurrency with easy accounts like @ackza allows you to send millions of dollars in crypto... without a bitcoin qr code, and it's free and Instant to use steem EOS and trx but with steem and its social media gaming can be integrated so easily, even just by posting scores at the end of each game for example, and streaming games on steem blockchain with Vimm.tv so already steem has gaming integration. Yeah ... I bought a few hundred TRon just in case it goes up. I’m earning about 100 Free TRON every day now too. wait how areuyou earning free tron?> Staking some gambling dappor you selling bandwidth to bit torrenmt? Can you show me how to do that real quick? If you see there is money to be made, nothing wrong with that. Is a really good choice, i'm going to see about.